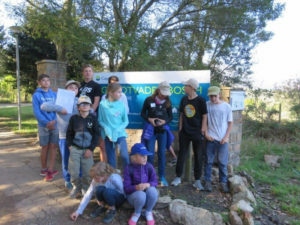 Our third Family Camp, held at Grootvadersbosch on the long weekend of 22 – 25 September 2017, proved to be a most enjoyable experience – for the children, their parents and those Cape Bird Club members running the programme. There were 34 participants – 32 in 8 cottages and one couple at the campsite. The ages of the 14 children ranged from 7 to 16 years. 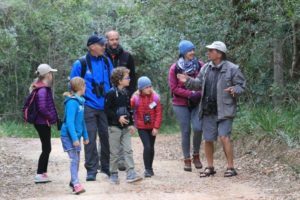 The aim of these camps is to gather together younger families with children and to give them a taste of birding and Cape Bird Club activities. 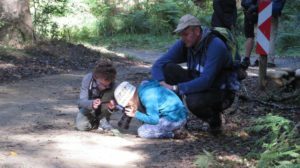 Families are not necessarily already members of the Cape Bird Club; we welcome any families showing an interest. The camp started rather later than anticipated because families were caught up in the exceptionally heavy traffic leaving Cape Town for the long weekend soon after lunch and then were slowed down even further by heavy rain as they neared Swellendam and Grootvadersbosch. Supper was eaten in participants’ cabins, after which all walked across to the hall in the as yet incomplete educational facility which the Cape Nature staff kindly let us use. 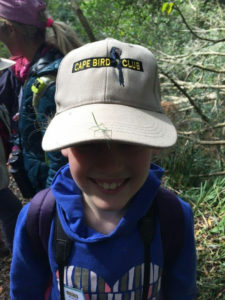 After introductions – to one another and to the programme, every child received a CBC cap and a camp booklet (drawn up by Loraine Codd) filled with information and puzzles and also bird-lists. Andrew Codd’s short and humorous presentation, ably assisted by daughter Samantha (changing slides) and son Marc (providing sound effects), was an introduction to some of the special birds we were hoping to encounter during the weekend. Participants were introduced to the camp challenges for the weekend: A photographic competition and the inter-cabin word puzzle competitions. Both children and adults were encouraged to take photographs which could be of anything seen or done over the weekend. For the birding-related word puzzle competitions on both Saturday (wuzzles) and Sunday (crossword puzzle) families were encouraged to work together and a prize would be awarded to the first-drawn correct entry on both Saturday and Sunday evenings. On Saturday morning we gathered before 7h00 and split into 2 groups. One group set off with Brian Vanderwalt and Andrew and Heather Hodgson leading, to explore the forest close to the cabins. The other group drove to the entrance gate to the reserve, parked the cars and then walked down in to the forest area to follow the BushBuck Trail. I was with this latter group and we were lucky to have with us Gillian Barnes, Andrew Codd and quite a few of the parents who turned out to be knowledgeable birders. One image which stays with me as we moved down the steep path towards the forest was of four Greater Double-collared Sunbirds in one tree highlighted in the rays of the sun. 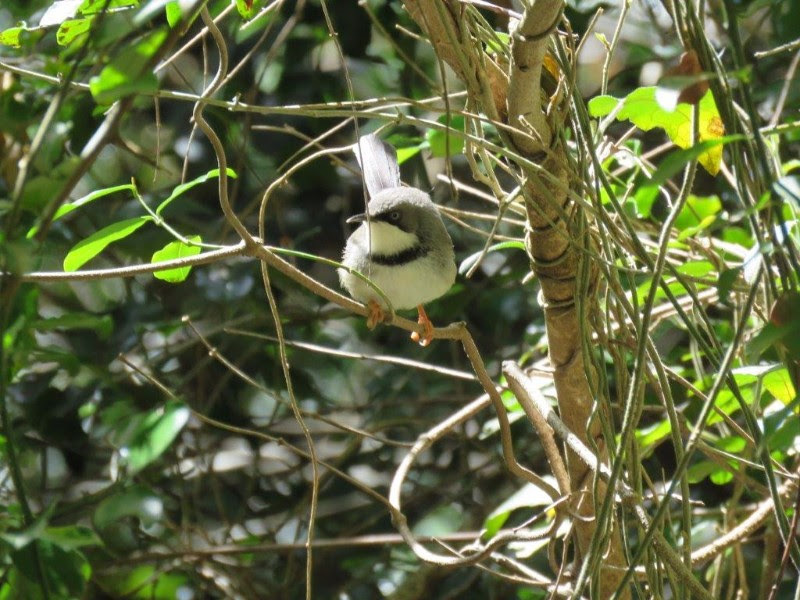 Before even entering the forest we had seen Fiscal Flycatcher, Sombre Greenbul, Cape Canary, Red-eyed and Cape Turtle Doves, both White-rumped and Little Swifts, Cape White-eyes, Red-winged Starlings, and Bar-throated Apalis. In the forest itself the confiding and inquisitive African Dusky Flycatchers abounded, watching us as much as we were watching them! A great sighting was had by most of the group of a Grey Cuckooshrike. 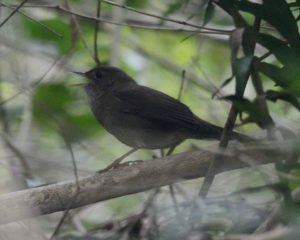 Other birds we saw in the forest included Cape Robin-Chats and Olive Thrushes. We all were very excited to hear a tap-tap-tapping and then to locate an Olive Woodpecker. An African Goshawk was seen flying rapidly away from us across the valley. After a short tea-break at the little stream at the bottom of the valley (where we heard but did not see Narina Trogon), we moved through the magnificent stand of historic Redwoods. It is difficult to imagine that the Redwoods in the US are 4 times as tall as these ones at Grootvadersbos! Terrestrial Brownbuls in the leaves on the forest floor got us all excited. We heard the ‘Piet-my-vrou’ call of the Red-chested Cuckoo (but could not see it). We spotted a group of Swee Waxbills as we emerged from the forest. While gathering breath after the uphill slog, we identified flying overhead African Black Swifts, Black Sawwings and Greater Striped Swallows. On the way back to the cars we saw Fork-tailed Drongos in the camping site. 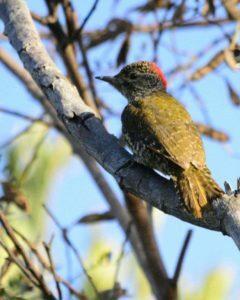 When we regrouped at the cabins it was to learn that Brian’s group had had just as successful a morning with their highlight bird being Knysna Woodpecker. They had also spotted buck on the forest edges near the cabins. Other wildlife seen included baboons and monkeys. After lunch and “free time”(some of the children had their bicycles and the bigger boys kept themselves entertained during “free time” playing soccer), there were voluntary craft activities – making seed bird feeders from recycled materials (organised by Priscilla Beeton) and also making plaster casts of baboon footprints (organised by Mathew Philogene and Brian Vanderwalt). Mid-afternoon we all gathered again so that Andrew and Heather Hodgson could explain about Geocaching, an outdoor treasure hunting game which uses GPS-enabled mobile phones. Participants have to navigate to a specific set of GPS coordinates and then attempt to find the geocache container hidden at that location. 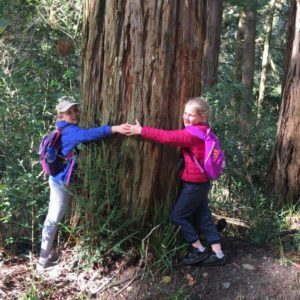 Families had to work out the coded clues to locate the two geocaches in the reserve and then all worked together to locate them: one was found at the entrance gate to the Reserve and the other at the foot of the tall tower bird hide. It was a lot of fun, and having been introduced to it, some families may well go on to become regular game players. Before returning to the cabins a large flock of Red-winged Starlings was seen flying overhead. An exciting observation along a wide green pathway was a small group of Red-necked Spurfowl. Supper around the braai fire saw parents getting to know one another better and the children running around playing hide-and-seek and other games in the dark. Sunday morning dawned overcast and much cooler. Most strolled to the waterfall, a lovely walk through a ‘newer’ part of the forest and we had our tea there. The older boys, however, rushed off with Andrew Codd to look for the Narina Trogon that had been heard the day before on the Bushbuck Trail – and they found it! Jonty Wright managed to take a pretty good picture of it through his binoculars. Upon our mid-morning return to the cabins, and a brief rest, Brian invited all who felt like it to join him on a walk on a very steep but magnificent downhill path which joined the road winding around the main forest. We searched unsuccessfully for Victorin’s Warblers in what should have been moist gullies – but despite the rain 2 days previously everything seemed very dry. We were compensated though by good sightings of sunbirds and weavers as the forest opened out. The views over the farmlands were wonderful too. Children who stayed behind rode their bicycles or enjoyed soccer while some parents just ‘chilled’. There was a lot of time for people to do their ‘own thing’ and also to go off birding on their own. In the middle of the afternoon Loraine Codd organised a treasure-hunt with clues hidden all around the camp, inside cabins and also in the surrounding forest. The two teams were decided upon by the children picking out a white or a pink marshmallow out of a bag! They loved that and the teams ended up surprisingly evenly spread across the ages. Team work was the order of the day and every child in a team had to participate in the activities and decisions so the older children could not just take over. This activity was definitely a favourite with much rushing around – and learning as it did involve birding related clues! After our braai we had the judging of the photographic entries (each person was allowed to submit 2 entries). There was much creative input – and judging was very difficult as there were some really good compositions! The younger children noticed the tiny things – some curly moss, a pattern in the bark of a tree, a drop of rain on the end of a leaf – that the adults often did not see. Andrew and Heather Hodgson, after that, arranged a short night-walk into the forest with torches – looking for frogs and insects and listening to the night-sounds. This was a favourite activity of Sebastien who found it fun and interesting, and Loraine reported afterwards that Samantha her daughter remarked to her that she might become an entomologist (Andrew had commented on how good she was at finding insects – and this has planted a seed …!) Afterwards, with those still up to it, Andrew shared some of his considerable knowledge about the night sky and led the group in some stargazing activities looking through binoculars. Monday morning came all too soon. Nearly everyone took their own walks to wrap up a few species before packing up and the final meeting to complete our bird list for the weekend. Our bird list numbered 61 species. We left have made new friends and having learned lots of new things! My birding highlight was seeing the male Narina Trogon which was an absolutely gorgeous bird. It was a highlight because I have never seen a male before and this was a stunning specimen. 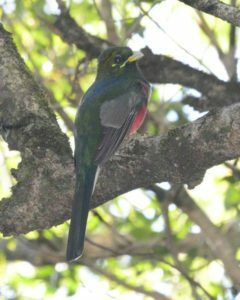 My highlight was seeing the Narina Trogon, it is a very rare bird and I had only seen the bird twice before. This year’s camp was fun because all the children got along. I also liked playing soccer with the other boys in the hall. I really did love this year’s camp, and I even made a new friend! My highlight was definitely cycling and going on the bird walks. I enjoyed this year’s camp because I saw a grey cuckoo shrike, which was a lifer for me. I liked the soccer. I liked the photographic competition. I liked making the tracks. I really enjoyed the birding weekend. The highlight of the trip was seeing a Victorins Warbler. The treasure hunt was also really fun. On the weekend I got to learn many things about birding such as how to use binoculars. Overall I thought the weekend was the best! I thank everyone who helped plan it. Highlight of the camp: I met a lot of new people and I liked doing the activities, and walks. Birding highlight: I learnt how to identify birds, by calls, and learnt what to look and listen for. Highlight of the camp: Making friends with new people and going on the walks, being in nature, and all the activities. Birding highlight: Learning the calls of the birds in “words” – like “ work harder” for the ring-necked dove, or “I am a red-eyed dove”, and the Hadeda joke! I even made up a call for one of the birds “I’m hungry I’m hungry”, but I can’t remember what bird it is. Emma Millar (Mother) summed up the overall feeling about the camp: I liked that it was structured but not so much that you couldn’t be flexible and do your own thing if you wanted too. The activities for kids were really great – the worksheets / crosswords / info booklets / photographic comp / treasure hunt etc. were so well done and really good fun. The overwhelming sense we have was how welcoming the bird club has been to us as new members and novices and how keen everyone is to share their time and knowledge. Very many thanks to the TEAM who assisted me in the planning and organisation: Andrew and Loraine Codd, Andrew and Heather Hodgson, Brian Vanderwalt, Gillian Barnes. We thank all the participants for their feedback which will help us in planning an even better Family Camp in 2018.